Hi everyone - hope your weekend is going well. This is another of my cards I made whilst in Swanage with Mum at the beginning of the summer. I took just a few supplies with me so that I had something to do in the evenings, it was great working like this. It challenged me quite a bit, but it was good fun. 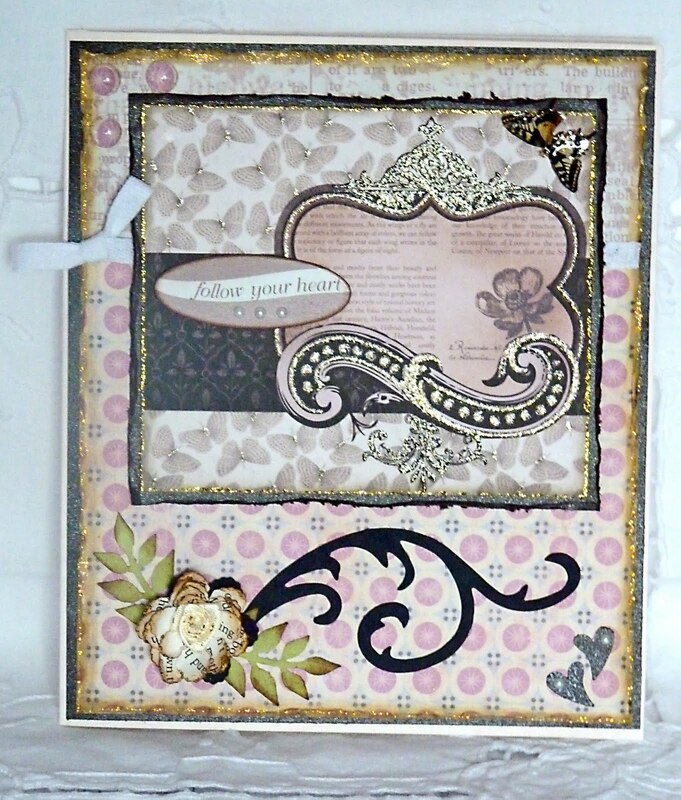 This card I used some backing papers from my box of bits and the main part is from my gorgeous Mariposa matstock - you know the stack that I just love looking at and don't want to use. It is already glittered so I just edged it with pumice stone DI and gold stickles. The embellishments are a butterfly from my downloaded collection and covered in crackle accents, some seam binding tape, a little flower made with dictinary paper and a little cream ribbon rose with ealnut stain Di on it; some punched leaves, a flourish from a TH die and two tiny punched hearts with pearls. 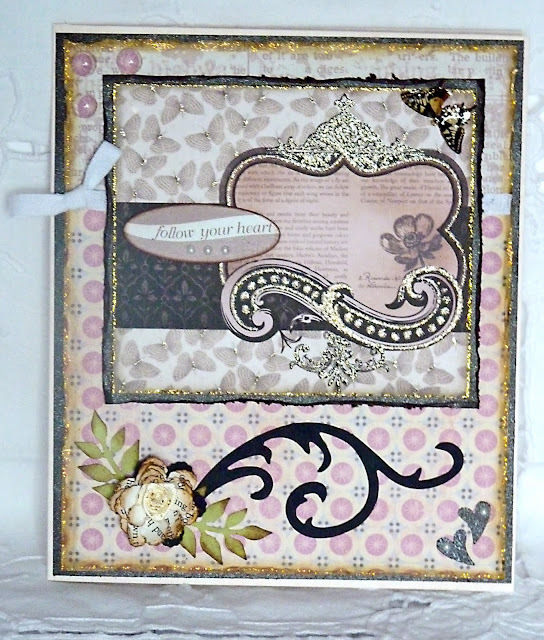 I edged the whole of the main background with antique linen and gold stickles. In the top left hand corner you might just be able to make out three of my glass glintz's with th pink circle shape stuck to them from the bottom DP. The sentiment is from a box of die cuts. Hey ho - it's just amazing what you an do when you challenge yourself. Enjoy the rest of the weekend. Have fun. Hi Brenda this I love it has a vintage look to it which I adore the butterflies and main image are beautiful so are the papers classy card. Hi Brenda, this is so very ELEGANT, I love all the silver, its so so gorgeous, I have just bought pumice stone DI this morning, I am going to try it on my edges now I have seen this.